"I noticed that you have the architect listed for our courthouse as L. S. Green. That is right and wrong. Our courthouse was built in two phases. The east wing (Records Building) was built in 1908, and was designed by L. S. Green. It was initially built as the county records building and is an exact replica of the Polk County Records Building, built in 1905, and designed by L. S. Green. 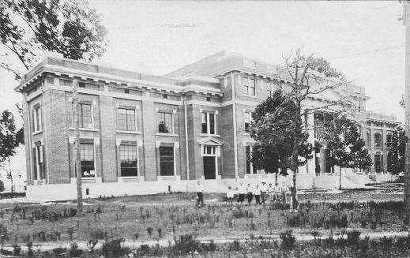 In 1914, the Trinity County Commissioners hired C. H. Page and Brother to design a new courthouse that was to incorporate the existing records building into the new courthouse. The Trinity County and Sabine Pass Land and Railway Company laid out the new town of Groveton in 1881, when the I&GN Railroad came through the area. The following year, Trinity County voters chose it as their seat of government. The company constructed a temporary courthouse for the county, and the fram structure, located at what is now Main at First streets, served the county until 1884. That year, the government moved into a brick building at this site. The construction was not solid, though, and by the early 1900s, county commissioners were concerned for the safety of county records. They hired W.A. Norris to build a records vault exactly like the one L.S. Green had designed for Polk County. They paid Green for the use of his plans, and the county moved its records to the building in 1908. In late 1913, the county commissioners hired C.H. 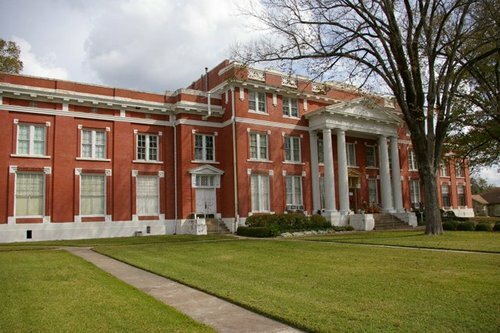 Page and Bros. of Austin to design a new courts building that would incorporate the 1908 records vault. Accepted in July the next year, the structure was rectilinear in plan, stretching to connect almost seamlessly to the records vault built on the east side of the courthouse square. Classical Revival features include a full-height portico with paired Tuscan columns, as well as brick parapet, denticulation, corbelled window surrounds and stepped wings. 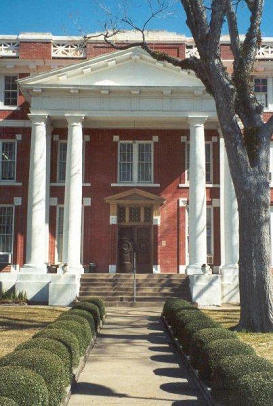 Today, the courthouse remains a center of county life. The site of parades, rallies and festivals, the structure is a symbol of justice and a unified citizenry. Within its walls, births, marriages and deaths are recorded, and fates are decided. It remains a link to the promise the future held for early-20th century residents of Trinity County, and to the efforts and dedication of those who have since worked to preserve the county's heritage. Photo courtesy Trinity County Historical Commission. 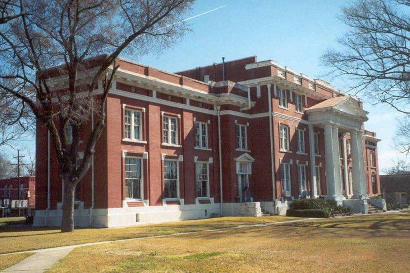 In 1914 C. H. Page designed the Trinity County Courthouse incorporating this original "Records Building." 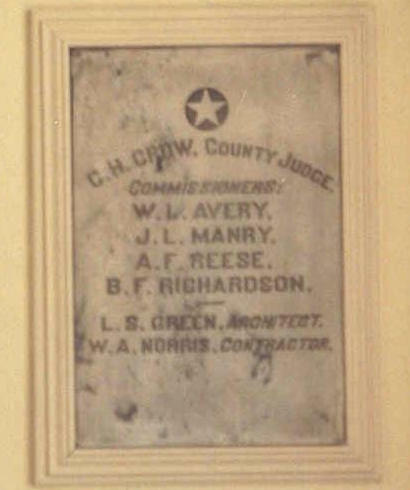 The cornerstone from the original 1908 records building on the inside of the courthouse. 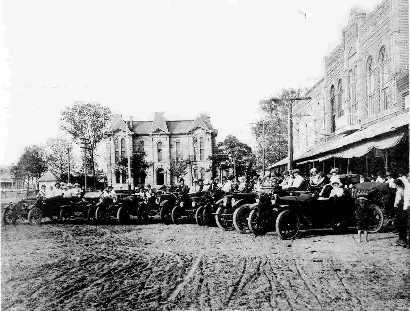 Early Trinity County motorists lined up for a photo in Groveton. 1884 Courthouse in background. The same vintage picture is hanging inside the current courthouse at the front entrance. 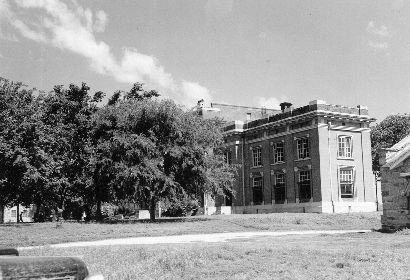 Some of the most delectable historical desserts of East Texas are found in the yellowed documents of the thirty-plus county courthouses scattered across the pineywoods. One such morsel is the little-known story of two courthouse fires in Trinity County, one of the rowdiest of our early counties. From Anna Hester of Groveton comes a pair of old affidavits by J.P. Stevenson, a frontier lawyer, and J.B. Gipson, the son of a county surveyor. Both lived in the turbulent 1870s. Their affidavits were transcribed in 1909, apparently in an effort to clarify property deed records which may have been in dispute. Stevenson and Gipson recalled a November, 1, 1872, fire which destroyed most of the county records at the first county seat at Sumpter. The only surviving documents were some criminal records of a peace justice and the surveyor�s records of properties in the county. At the time, Gipson�s father, George, was the county surveyor and was holding the survey records at his home in Trinity, about twenty miles west of Sumpter. Stevenson had a good reason to remember the fire. As a lawyer in Trinity and Walker counties since l868, his life revolved around the courthouse and the records lost in the fire. Why and how the courthouse burned is not clear, but Sumpter was a hotbed of violence during the l860s and early l870s when federal reconstruction gripped the South in the aftermath of the Civil War. Out of this violent era came a Sumpter preacher�s son, John Wesley Hardin, who killed three Union soldiers near Sumpter in 1868, and went on to become Texas� most notorious gunfighter. 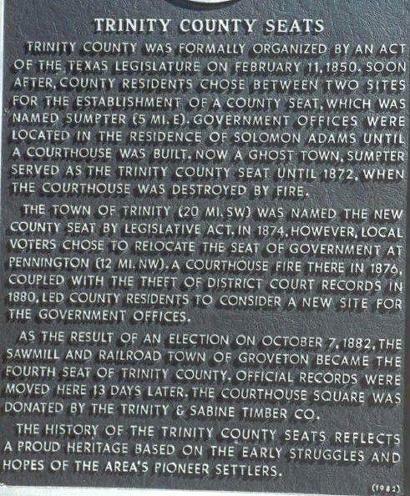 When the Sumpter courthouse burned, the county seat was located at Trinity in 1873. It remained there only until 1874 when it was relocated at Pennington, where, according to Stevenson, another courthouse was burned in 1876, again destroying some county records. The county�s land records and criminal documents, however, were saved. J.T. Evans, the clerk of the local district court, kept the criminal records in an iron safe, which survived the fire. Evans also carried the property deed records to his home the night of the fire after �a number of bad parties had been indicted� and he became �fearful they would undertake to destroy their indictments� by burning the courthouse. �By reason of this fact, they were again saved from fire at the burning of the courthouse at Pennington,� wrote J.B. Gipson in his affidavit. 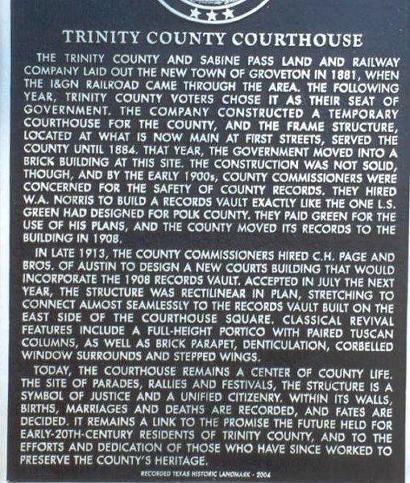 Trinity County moved its courthouse from Pennington to Groveton in 1882, not only because it was a cental location, but Trinity County Lumber Company donated the site for a town square and materials for a new courthouse. It remains there today.